The story shared below is done so with permission given by the patient. This story was provided by Sonya Dilworth, MSW, at DCI Humboldt. Beverly Givens learned she would need dialysis in 1986. 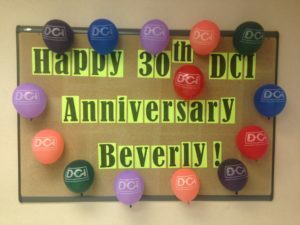 On July 29, 2016, Beverly celebrated her 30 years on dialysis. Dialysis machines are newer and up to date now, but back when she began dialysis, she recalled the machines were very simple and moved very slow. The entire hemodialysis process is faster and modernized now. Beverly began dialysis when she was in junior high school. 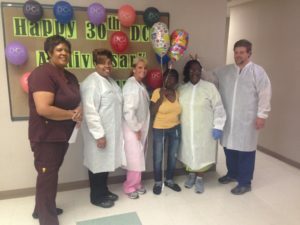 She was younger than most of the other patients on her dialysis shift in 1986, but she believes her age was an important factor in her surviving 30 years on dialysis. While undergoing dialysis, she attended school and had two kids at the time. “I followed my diet and took my meds as ordered. Also, I attended my treatments as ordered. I tried to follow the rules like law,” she shared. Today, Beverly has 3 adult children and 5 grandchildren. She had her last child while on dialysis. Beverly’s mother, sisters, and brothers continue to be supportive to her. She received a kidney transplant; however, her body rejected this kidney after two months. Upon reflection, Beverly shared that the kidney was not a good match and the transplant medications back then just weren’t as effective as they are now. Try to listen to the doctors and nurses regarding your care. Try to follow your diet and meds as ordered. Come to treatments as prescribed. 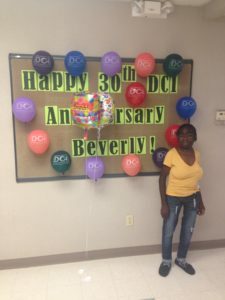 Congratulations Beverly on 30 years of dialysis!